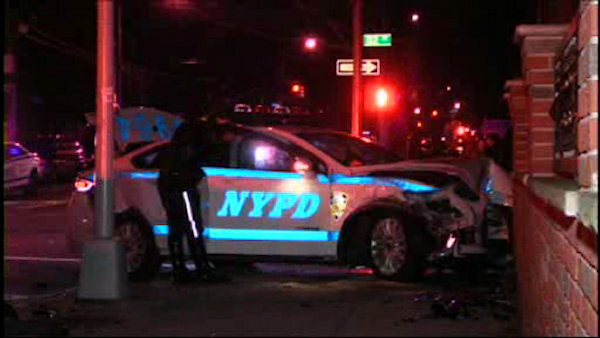 JACKSON HEIGHTS, Queens (WABC) -- Two NYPD officers were hurt when their cruiser collided with a livery car in Queens. It happened around 9 p.m. Tuesday near the corner of 82nd Street and 32nd Avenue in Jackson Heights. The squad car ended up on the sidewalk and struck a brick fence in front of a house. The officers and one civilian suffered minor injuries.